Every now and then, while cruising around the internet, I come across something that just appeals to me. 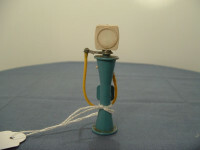 This air pump showed up while searching for information on something else, so I bought it! After quite some time I finally identified it as a Kemlow K65 Air Pump thanks to Paul Brookes' excellent book "The Illustrated Kemlows Story" [ self published in 2009, ISNB 9780 9561879 0 1 ]. 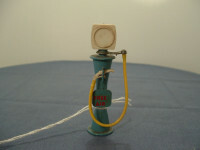 The air pump is a tapered column with bracket for the handle of the air hose and a squarish sign in the centre reading "Free Air" in red lettering. Above the column is a white plastic pressure reading gauge, devoid in this example of its yellow decal. 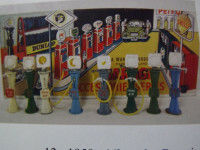 The air hose is yellow plastic tube with a white plastic nozzle that looks more like a petrol pump nozzle than that of an air pump. The date of issue is circa 1958 as this is the date given in the book for the start of production. 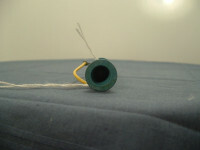 The item is marked "Made In England" to the right hand, lower side, as viewed from the front. Originally sold in boxes of 12 at 1/2d (one shilling an two pence) and marketed as "A Wardie Product".